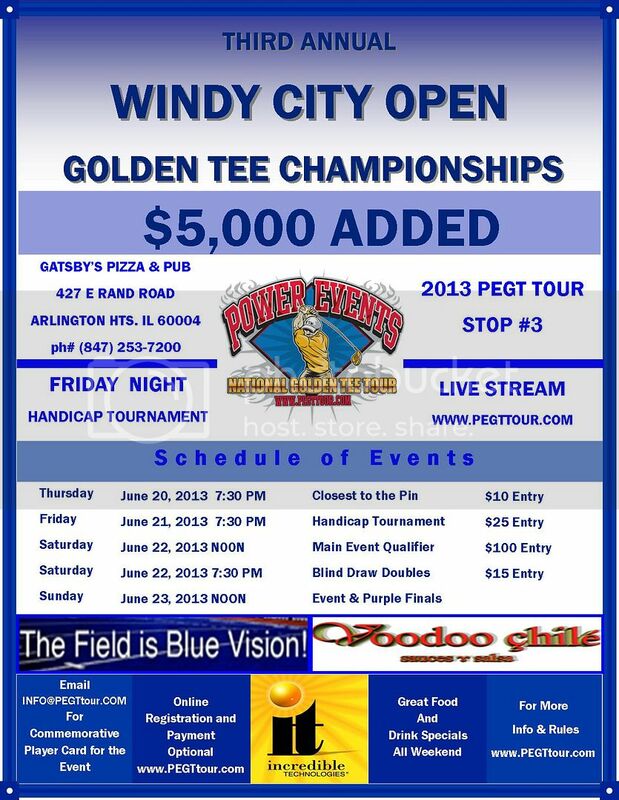 The Third Annual Windy City Open - going back to Gatsby's. Lots of giveaways for all players. We will keep you posted on possibly some bigger door prizes. All matches to be played on Pedestals and 2013 Courses. Block Rate Red Roof Inn Chicago - OHare in Arlington Heights. 847-228-6650 22 West Algonquin Road, Arlington Heights, IL 60005 off I-90; exit at Arlington Heights Rd (from airport)http://www.mapquest.com/The Red Roof Inn: $44.99 (2 dbl beds) per night. The name of the booking is under: Golden Tee The check in code for the special rate of $44.99 is: T102 Can upgrade to $54.99. Which, is for a room with 1 king size bed, refridge & microwave. I booked my hotel via Priceline's "Name Your Own Price" option and got a 3 star hotel for $45/night (after taxes and fees it comes to $55/night). It's the same hotel I stayed at the last time the tourney was at Gatsby's. It's the Wyndham Garden Hotel Buffalo Grove...a little less than 3 miles from the bar. It's still a little far out so if you wait, you may be able to get it for cheaper as the tourney date gets near, but then again, you may get a different hotel altogether. I tried initially for $40/night yesterday, and I had to wait 24 hours to try again. Go to Priceline.com and click on the Hotels tab then click on the "Name Your Own Price" link. For the city, enter Arlington Heights, IL and the dates you plan to stay. Under Step 1 (area) select check box 3 (Arlington Heights NORTH). Under Step 2 (star level) select 3-star upscale. For Step 3, name your price. Here, I entered 45. You can try cheaper if you want, but they rejected my $40 offer this far out. If they don't accept your offer, you can try again in 24 hours. Since you have plenty of time, you can try each day for the lowest price possible if you want to hassle with it. Enter your name and click Preview Offer. You can figure it out from here. You ultimately enter your credit card info, and click "book". The website then negotiates your offer. If it accepts your bid, it bills your card. If it doesn't accept it, it asks you to change some of the criteria with your search. If you want to wait 24 hours, you can bid with the exact same criteria but just try a higher price. You may also be able to get a 2 1/2 star for $35 or $40 a night if you want to slum it down a little. However, the Wyndham Garden was a fairly nice hotel IIRC. ETA: The location of Gatsby's seems to be directly in the middle of three search regions, Arlington Heights (2), Arlington Heights North (3), and Schaumburg (16). I went with Arlington Heights North to try to get the Wyndham again which I did...it was a nice hotel for the price. However, if you want to try one of the other regions (Schaumburg has a "best deal" icon next to it), you may well get a cheaper rate for $30 to $35 a night (for a 2 or 2 1/2 star). EETA: Apparently, since I'm only staying till Sunday, the $45 rate was not working for a Monday checkout. If you stay till Monday you can get it for $48 a night. However, there is a workaround for this. If you book till Sunday @ $45, Priceline will send you an email asking if you'd like to extend your stay for the same rate. You can add one more night to stay till Monday for the same $45/night rate. Hope this helps. EEETA: Also, after booking the hotel, I was offered to add a rental car to my trip. You could get an economy car for $12/day. I opted for the full size at $16/day. However, with fees and taxes associated with rental cars, it actually comes out to $33/day. The economy would have come out to $28/day total. So if you're looking for a rental car as opposed to cabbing it to and from the airport and hotel (unless you're drinking heavily), this isn't a bad price. Golf Outing Friday June 21st location to be determined. Graig Kinzler to host. Separate sign up to be posted. Jefe has done it again. He has given us 4 FREE Entries to give away to the NIV X in October. We will give one free entry away at Orlando, St Louis, Chicago, and Denver to the 32nd overall qualifier in each event.